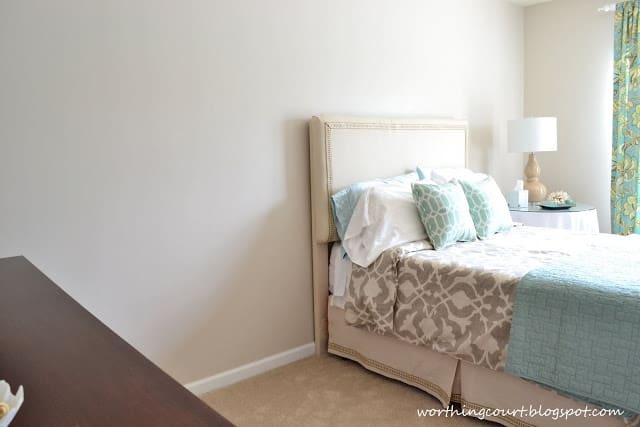 UPDATE: Enjoy this project for a bedroom in our former home. We’ve moved and are giving our new-to-us home a complete remodel. I’ve completely changed my style! Click HERE to take a look. Have you ever had a vision in your head and can’t find just the right thing to pull it together? Oh – and let’s also add the caveat that it has to be done on a slim budget. That was the place that I found myself in while trying to figure out what just the right thing would be for a nightstand in my guest room. I sure had a case of DP. That would be Decorating Paralysis. In an effort to cure myself, I turned to all of you for advice. Well…after taking all of your suggestions into consideration, this is what I decided to do. BTW – thank you to everyone who took the time to help me out. You all had some great suggestions! Just for fun, I tallied everything up and added it to the bottom of this post. When I asked for your help, I should have mentioned that there is only about 4′ between the side of the bed and the front of the dresser. 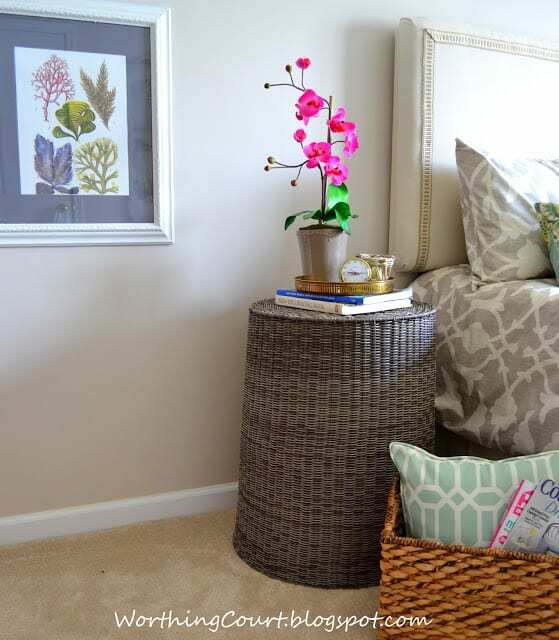 My vision included something with texture and something besides a plain brown nightstand. It couldn’t be anything too colorful because I also plan to paint the dresser and mirror that reside in this room. So one fine day, while browsing the aisles of TJ Maxx, I came across a gray wicker laundry basket. Bingo! Turned upside down, I think it makes the perfect nightstand for this space. Everything was looking all taupey-gray and bluish-aqua, so I wanted to add one more little pop of color for interest. When I found these botanical sea prints on Art.com (with 30% off that day! ), I knew that adding little touches of pink/fuchsia would work well. I mentioned that I’m doing this room makeover on a slim budget, right? And we all know how expensive art can be – right? Did you know that you can spray paint mats? Yep, you can! The ones that I had were a horrid color. So a few light coats of gray spray paint did the trick. If you try painting a mat, just make sure that you don’t get the mat wet by adding too much spray paint at one time. Several light coats, that dry thoroughly in between, do the trick. I put the nightstand vignette together using a vintage brass tray that I found a few months ago at a favorite local shop called Chartreuse. I love the open fretwork and of course the patina of the aged brass. I’m glad to see brass making a come back. What about you? 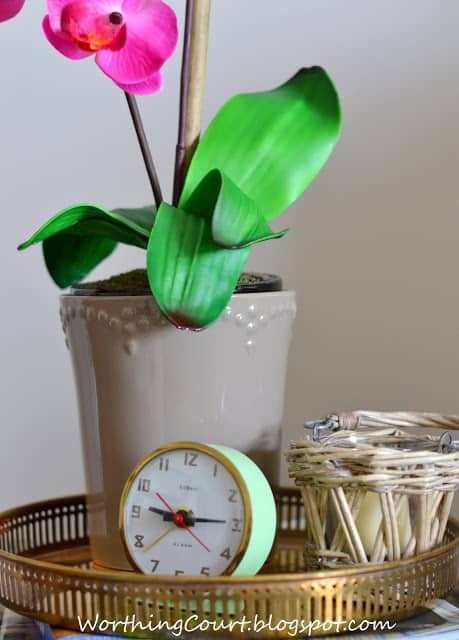 When I found this cute little vintage clock at The Carolina Vintage Market last month, it hoped right into my hot little hands. I’m really pleased with how this little area came together. I loved all your ideas and really did consider each one. I especially liked the suggestions to add a mirrored table/chest. 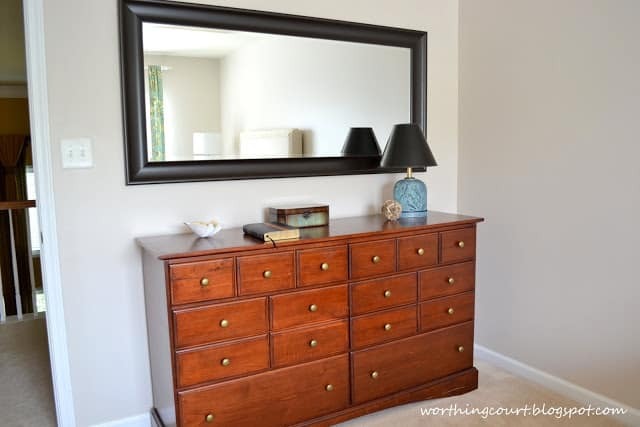 But in the end, I decided that I really wanted something with texture and since the side of the bed is so close to the dresser I didn’t think a chest of any kind would look right. Thank you again for your help everyone! The next project will be to paint this dresser and mirror. 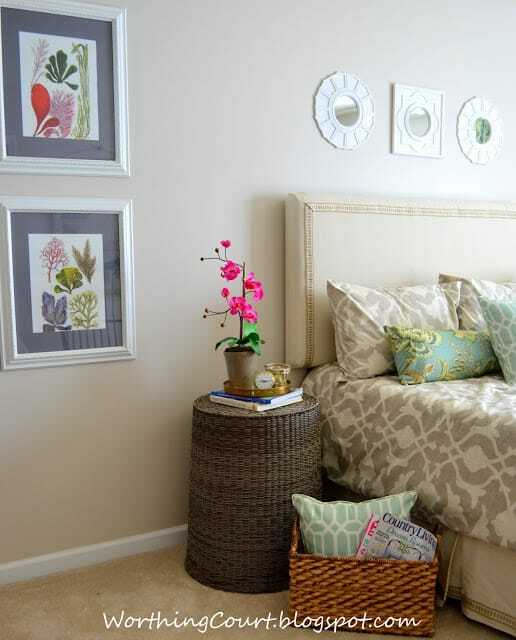 The basket makes the perfect bedside table. I love old brass too. Great idea, Suzy! I would never have thought of that! What a great solution, Suzy. No one will ever think that it is a laundry basket/hamper at all. I love that little tray. Can’t wait to see it all finished up!! 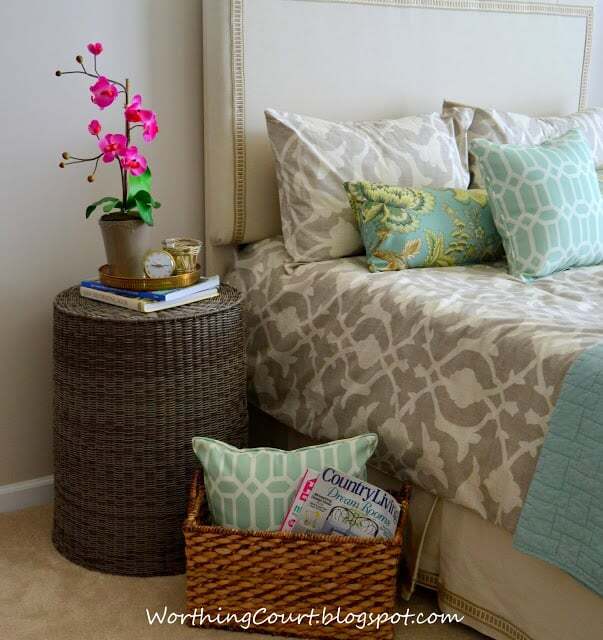 I love the wicker used for the side table and the pop of color is perfect. Looking forward to seeing the dresser redo. The texture and color are perfect. Good idea! I really do love it being round as well! The table is perfect and great vignette Suzy! It looks amazing, what a clever idea! way to think outside the box…or…basket. lol. love the texture it brings, too. Great idea! It looks fantastic. And I love the way you match the colors in that room. 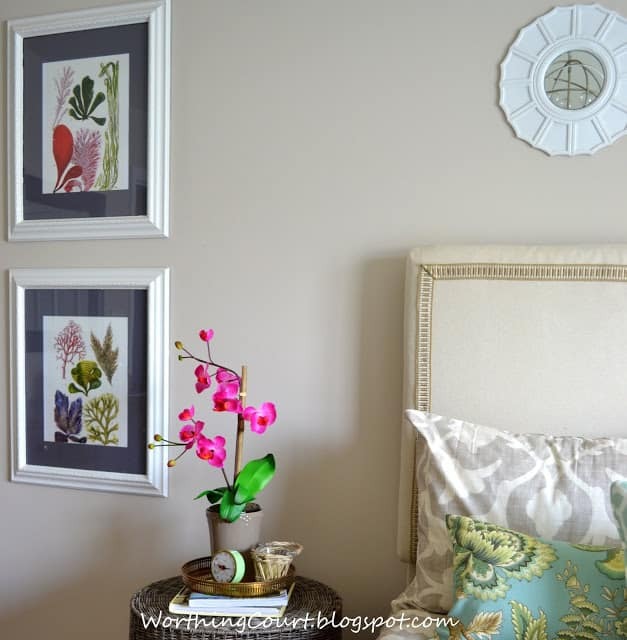 I love all the touches that bring your bedroom together! 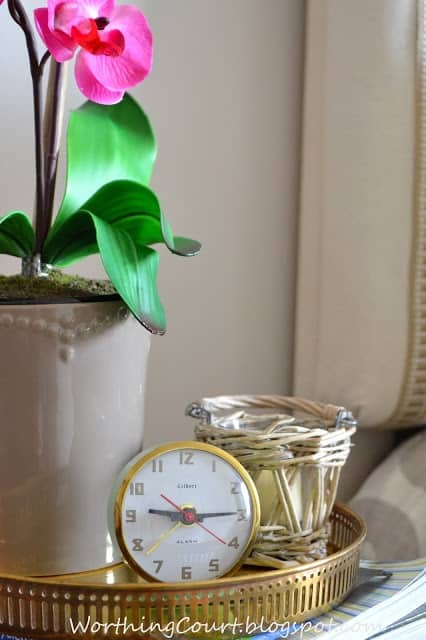 Love your nightstand, too! I would have never thought to turn one over to use as a nightstand which I’m actually looking for my bedroom. Love TJMaxx too! I have a wicker basket as my endtable too!!!!!!!!! 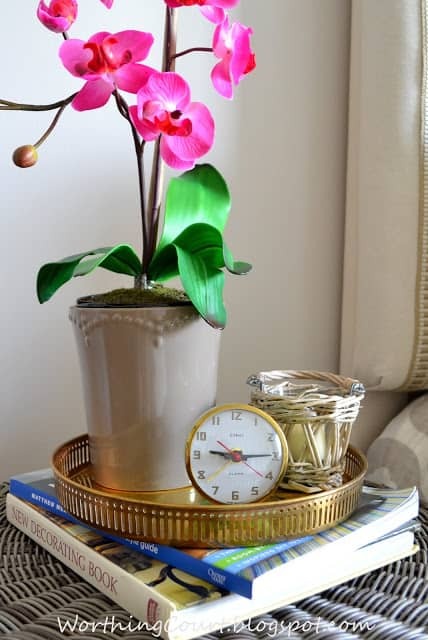 Love yours – they make great tables for space challenged rooms – of which mine is also! That’s a perfect solution, it looks great! I love seeing a space come together on a shoe string budget. I have painted picture mats before. It’s crazy how expensive they are and if you already have some that are just not the right color, painting is a great way to get what you want and save some money. Thanks for sharing your creative way of spicing up your space with the before, during and after photos. 😉 I’ll be reading more of your posts for inspiration since I’m moving soon and ready for some changes in my decor, but don’t really have the money to spend on pricey items. Can I ask you where you got your bedding? I looove it. Hi Jennifer. I found the bedding at Bed Bath & Beyond. It’s from the Barbara Berry Poetical collection. The photo here on the blog is much closer in color than the one shown on their website. Let me know if you need me to send you the link. Thank you for stopping by! Suzy, thank you so much. It’s just perfect. Is the skirt from the same collection? No, I’m afraid not. I made the bedskirt and upholstered the headboard with drop cloths. Well, it looks absolutely fantastic…I never would have known.